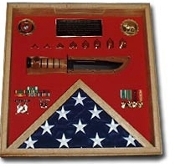 Some servicemen and women have more unique memorabilia they would like to display. Swords, pistols, knives and coins all make for extremely interesting displays, sparking conversation with each and every visitor. We have designed several different variations of display cases to accommodate almost anything you wish to put on display. Our sword display cases, for example, give you several different options from which to choose. You have the swords. You decide how you’d like to show them. 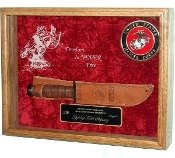 Our knife display cases also offer a variety of ways to display. Coins, ribbons, certificates, you name it, and we can help you display it. 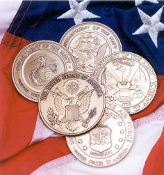 From shadowbox display cases to coin display to nameplates and beyond, Flag Connections is your one and only stop for the best in United States Armed Forces commendation display products. Veterans of the United States Armed Forces serve our country in a variety of different ways. Whether they are on the front lines of a battlefield or taking care of administrative business right here at home. Every single person is valuable to securing our way of life. As a small token of our appreciation, the United States Government, on behalf of we the people, bestow various medals and honors to our servicemen and women. These honors vary; depending on the branch of service and the particular reason the veteran is being given the honor. Whether it is a medal, a flag, a certificate or a ribbon, these honors are bestowed with the intention of expressing deep gratitude for sacrifice and service. When you stop and think about it, you realize how important it is to display them in a manner in which friends, family and visitors can share in and understand what it means to be an American. At Flag Connections, we understand what it means to be honored for service to our great country. Veterans, who have served our country well, craft every one of our products. They know the meaning of honor and appreciation. 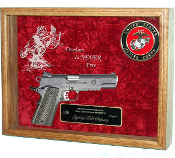 Every flag display case, shadowbox, and name plate is assembled with dedication to perfection. Getting the job done right is what makes all American servicemen and women great. We carry on that tradition in our workshop because we believe our veterans deserve no less. We have virtually every type of display case you could ever need when trying to decide on how to display your or your loved one’s commendations. American Flags are given for service on special occasions, not the least of which is a funeral. 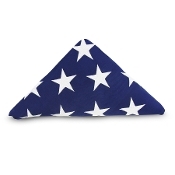 Knowing how important it is for family members to display this great honor, we have designed and developed a beautiful set of flag cases in which the American Flag given for burial can live on for years to come. Those who receive medals and commendations during their service can finally display them with honor and pride. We offer a wide variety of medal and certificate cases to meet any need. Our shadow box design allows the medals and other memorabilia to rest comfortably behind beautifully smooth glass, making their display a delight to behold.